In previous newsletters we told you about Sinlayehu, and this year we met with her again. She asked if we could help with the cost of medical treatment for her daughter Bizeyehu as she had a terrible eye infection. Although Sinlayehu has regular day work her salary is not enough to pay for any medical treatment. 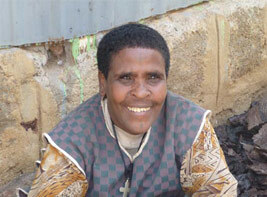 We agreed to take Bizeyehu to the local clinic and arranged to meet them the next morning. As the clinic is several miles away we hailed a three-wheel taxi to take us there. Bizeyehu at this stage was looking very apprehensive, and we then realised that this was the first time she had travelled in any form of motorised transport. She held on for dear life, but as we hit every pothole and bump in the road exaggerating the impact she was soon roaring with laughter and excitement. Her treatment at the clinic was excellent although a little daunting for her. The diagnosis was that it was an infection she had had for some time causing some damage on the eye, and if left untreated this would cause permanent damage. Antibiotic drops was the order of the day, total cost was £2.50 and possibly a sight saved. On the way back we asked why Bizeyehu was not at school, and Sinlayehu said that she was unable to afford it but dreamed of her daughter attending school. This was soon resolved. We found her some new clothes and after speaking with Sister Terfartu, Bizeyehu started school that morning, thanks to your sponsorship. As days go this was a big one for Bizeyehu, a taxi ride, a trip to the clinic and a first day at school with new clothes. We had some tears when she had to leave her mum but when we saw her at lunch she had settled in well, with a full belly, as her sponsorship includes lunch everyday. Following our return we have been told that Bizeyehu is still attending school and enjoying herself and her mother can continue to find day work knowing she is being looked after and fed each day.